In its 41-year-old history as the White House hub of innovation, the Office of Science and Technology Policy has never gone this long without a leader or official mandate. The science office, which takes up half of the fourth floor of the Eisenhower Executive Office Building, has a fleet of empty desks. 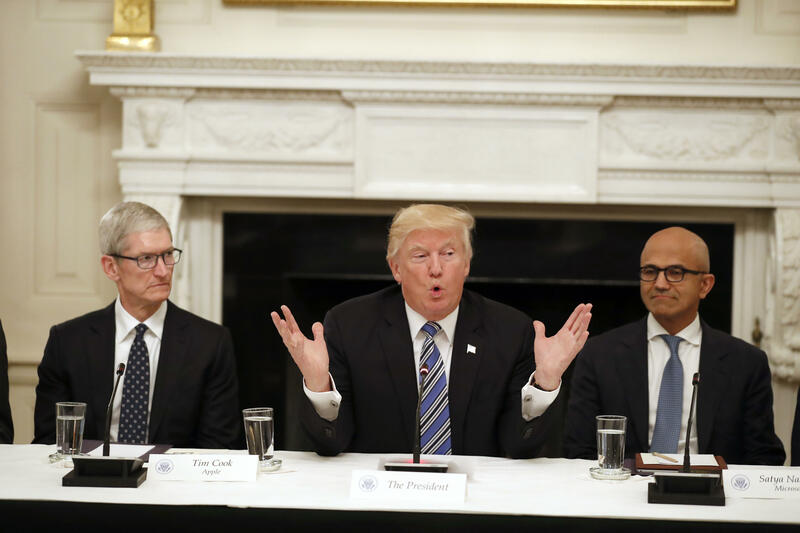 The OSTP, as administration staffers refer to it, has hosted two events since President Trump took office: One on drones and another on "American Leadership in Emerging Technology" that prominently featured the high powered tech executives in attendance like Amazon CEO Jeff Bezos and Apple CEO Tim Cook. But nine months into his administration, there's no clear indication that the president is close to naming a science adviser who will inform his policymaking, though that's the mission that the OSTP has played since its founding in 1976 by President Gerald Ford. From climate change to space to education, the office has served as an in-house incubator for research, data, and crisis management that drove policy under seven presidents. A White House official, when asked when there would be a nomination for OSTP director and science adviser to the president, said there were no personnel announcements to be made at this time. Under Mr. Trump, the OSTP staff has dropped to 45 staffers, a substantial decline from President Obama's OSTP, which had a staff of 135 people. Another difference from the Obama years -- the majority of Mr. Trump's OSTP staffers do not have a background in science. The office hasn't formally been restructured, but a White House official said the team has "naturally" streamlined over the past few months with a narrowed focus on three main issues: technology, science, and national security. Mr. Trump's OSTP has disintegrated into a shell of what it once was under President Obama: what Obama's OSTP director and senior science advisor Dr. John Holdren called "a science and technology magnet." "It was clear that [Obama] understood how and why science and technology matter to virtually every facet of the national agenda and that he would understand and run with good ideas presented to him," said Dr. John Holdren, the former OSTP Director and senior science adviser to Mr. Obama. "Trump is a science and technology talent repellent." The vacancies have drawn scrutiny from seven Democratic senators, including New Hampshire Sen. Maggie Hassan and New Jersey Sen. Cory Booker, who sent a letter to President Trump on Monday, urging him to fill the open positions. "In previous administrations, OSTP was central to disaster mitigation efforts, including hurricanes -- but when Hurricane Irma, Harvey and Maria struck the U.S., OSTP lacked key leaders," the letter read. "Scientific and technical input would also have contributed to decisions around climate change, the Iran nuclear deal and North Korea's nuclear program -- areas where key decisions have been made over the past nine months in absence of a science adviser and other officials." The @WHOSTP Twitter handle was finally created 290 days into the Trump administration and has picked up 382 followers. Out of the five existing tweets, four of them feature the work and photos of Michael Kratsios, the U.S. deputy chief technology officer. Kratsios, a 31-year-old former chief of staff to Silicon Valley venture capitalist Peter Thiel, majored in political science at Princeton, that being the extent of his experience in the field of "science." Thiel was Trump's most prominent supporter from the tech industry. Kratsios, who was appointed to his role in March, proved to be a beneficiary of that relationship. The OSTP has not offered a reason for why the White House has yet to nominate the office's top Senate-confirmed positions that work side by side in the office, the OSTP director and the chief technology officer (CTO). Another White House official could not confirm whether or not Mr. Trump planned to nominate a CTO at all. Sources say Kratsios has been angling for the role himself and describe him as a micromanager who has created a highly controlled work environment that has had a stifling effect on the few careerists still in the office. "I don't know if he'll go up for the nomination," a White House official told CBS News of Kratsios potentially being named CTO. "A lot of times, we've seen across different administrations deputies just filling in." (The CTO position was only created under the Obama administration). That sentiment may be wishful -- at least a few former OSTP staffers think Kratsios is unqualified for the job. CBS News spoke with multiple former OSTP staffers on the condition of anonymity because they were not authorized by their current employers to speak publicly. "I think one of the reasons that he is not named the CTO is because although he comes from the tech community, he is not a technologist," one former OSTP staffer told CBS News. Under Mr. Obama, Megan Smith, a former vice president at Google who had two degrees in mechanical engineering from Massachusetts Institute of Technology, served as CTO. Kumar Garg, a former OSTP staffer under Obama, argued the Trump administration should nominate someone to run the office who can withstand Senate scrutiny. "OSTP is a congressionally-chartered office and the new administration should put forward whoever they believe should play a senior leadership role – they should put forward those folks towards Senate review," Garg said. Because of the rocky transition process, the incoming Trump administration only turned its attention to the science office a week before the inauguration, after many Obama-era OSTP staffers had already departed. Reed Cordish, a 43-year-old former professional tennis player-turned-real-estate-developer, showed up alone to OSTP to get a better sense of the office, and even then, it was for not more than an hour. Cordish currently serves as an assistant to the president for Intragovernmental and Technology Initiatives. "The first and only contact that OSTP leadership had with any member of the Trump team about the transition at OSTP did not take place until a week before the inauguration, was with an individual with no particular background in science, technology, or science and technology policy, and lasted exactly one hour," Holdren told CBS News. "We handed over our 100+ chapter transition book and never heard a peep back. I have no idea whether anybody read it." A source in the room said that at the end of the brief meeting, Cordish told the group that he wanted to "make sure you guys stick around," but most staffers had already made alternative career plans, given that no one in the office had heard from the Trump transition team until that point. One former senior OSTP staffer ended up leaving his post early once Trump staffers did finally inhabit the office because even then, no one was interested in speaking with him. "One of the reasons I left early is that I didn't actually talk much to anyone," the former OSTP staffer told CBS News in an email. "I met Kratsios but didn't have a chance to actually talk to him and tell him what I was doing, what I knew, etcetera. I walked out with a clear conscience. I did my part to ensure a peaceful and orderly transition." The OSTP was more fully integrated into the Obama administration. It was responsible for putting together the five-year strategic plan on STEM education, in coordination with the Department of Education, The National Science Foundation, The Smithsonian Institution, and the White House. And it helped propel the expansion of the renewable energy industry, making wind and solar energy competitive with coal, gas and fossil fuels by securing $4 billion in private sector commitments to foster clean energy innovation. The OSTP had a seat at nearly every high level discussion in the Obama administration, but that's a privilege it no longer enjoys. "There is no substitute for senior leadership," said Cristin Dorgelo, a former OSTP Chief of Staff under Obama. OSTP, he added, "provides a path for escalating tough issues among leaders in the White House and members of the Cabinet. That lack of leadership makes for a stagnant OSTP." Even the White House science fair -- initiated by Mr. Obama in 2009 -- seems to be falling by the wayside. One source tells CBS News that former OSTP staffers left behind all of the necessary information to enable the office to conduct the one-day affair. But despite assurances to CBS News from the office earlier in April that the Trump administration would be hosting a science fair in 2017, an OSTP spokesperson told CBS News that "with the holidays on us, it would be tough to pull together before January." The federal budget process, too, is feeling the effects of the OSTP staffing shortage. Historically, OSTP participates in the budget-writing process with the Office of Management and Budget, to recommend research and development priorities for federal agencies. But the 2018 budget -- which saw a 20 percent decrease in research and development funding -- was crafted without input from OSTP's Assistant Director of Federal Research and Development. That role has gone unfilled in the Trump White House. The research cuts were, in the words of one Obama administration OSTP staffer, "unprecedented and dramatic" reductions that would have otherwise funded the NIH, the Department of Energy and NASA. Just days after Mr. Trump released that first federal budget, which proposed eliminating NASA's education office, Ivanka Trump and Secretary of Education Betsy DeVos hosted an event at the NASA museum to highlight science, technology, engineering and mathematics (STEM) education. "It's difficult to discern malevolence from incompetence," another former OSTP staffer griped. Former OSTP staffers are also concerned that national security will suffer, too. One source of anxiety is China's aggressive investments in artificial intelligence. Over the summer, the country unveiled a development plan to be a leader in the field by 2030, supplemented by multibillion dollar investments in artificial intelligence and quantum computing. The Obama administration released two comprehensive reports on A.I. in 2016, spearheaded by Dr. Edward Felten, a professor of Computer Science and Public Affairs at Princeton University and the founding Director of the Center for Information Technology Policy. A White House official said that the National Science and Technology Council Subcommittee on Machine Learning and Artificial Intelligence still exists but referenced only one policy lead assigned to the issue "who does a lot of data work." In 2016, the federal government invested approximately $1.2 billion in research and development in "AI-related technologies," and recommended that even more money be spent on basic research on A.I. But there has been no mention of the issue by the Trump administration, except by Treasury Secretary Steve Mnuchin who dismissed the threat of robots displacing humans as "50 to 100" years out. "It's not even on our radar screen," he said at an event in March. He later clarified his comments in May. "When I made the comment on artificial intelligence -- and there's different views on artificial intelligence -- I was referring to kind of like R2-D2 in 'Star Wars,'" Mnuchin said during a congressional hearing. "Robotics are here." OSTP wasn't designed to be a center of research and development on A.I., according to Dr. Holdren, but the office previously advised the president and national security adviser on its economic and security implications and urged the U.S. to take the lead on the issue. "I doubt it is doing that now, with its total staff of forty, and nobody like Ed Felten," Holdren said. "You have a number of experts in both science and technology and national security who are comparing this to a Sputnik moment for the U.S.," another former OSTP staffer added.